Intex pools are popular with those who want the fun and excitement of a swimming pool without the hassle and expense of installing an in-ground pool. But when setting up any type of above ground pool, including an Intex metal frame or inflatable pool, it is critical that the ground be perfectly level. Without a level foundation the pool will quickly become unstable, so it is important to make the right preparations before adding a drop of water. Look around your yard for the flattest spot you can find. Choosing a spot that is already fairly level will make your job a lot easier. It will also reduce the amount of sand you will have to purchase. Cover the spot you have chosen with a piece of plastic sheeting or a tarp. Secure each corner of the tarp or sheeting to hold it in place. Leave the plastic sheeting in place to kill the grass and get the area ready for the pool. Make sure the spot you have chosen is wide enough for the pool you will be setting up. Use a level on a long board to find the high and low spots of the area you have chosen. If there is more than two inches of difference between the high side and the low side you will need to remove dirt to make the spot more level. 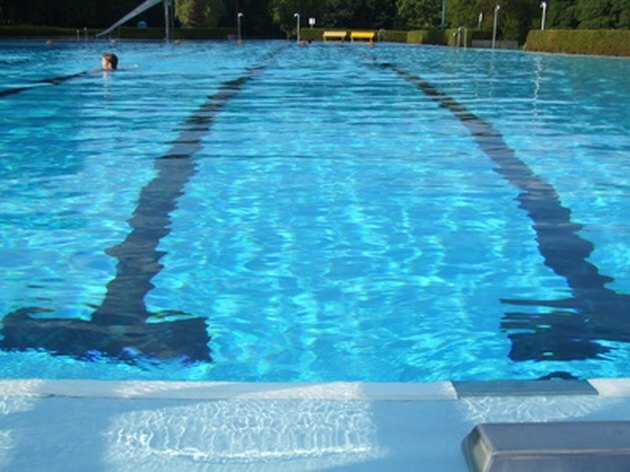 The board you use should be the same length as the width of the pool you will be installing. So if you are putting up an Intex inflatable or metal frame pool with a width of eight feet you would need a board that is eight feet long. Dump sand onto the chosen spot, making sure that the sand is a few inches deeper on the low end of the spot. Rake the sand after each load has been dumped, then use your level to check the status of the site. Continue to add sand to the location until the ground is perfectly level. Wet the sand to make it compact and tamp it down. You can rent a lawn roller at your local hardware store and run it over the sand to pack it down. What Is the Easiest Way to Level Ground for a Pool?